Turtle and her mother barely make ends meet. They dream of owning a mail-order home, instead of getting free room and board in the houses where Mama does chores. 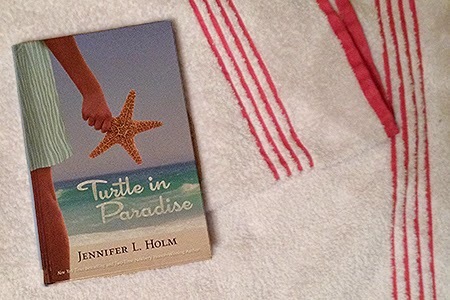 When a woman who hires Mama doesn’t want children around, Turtle is shipped off to Key West to stay with her aunt. Turtle spends her days with three boy cousins and a group of their friends, who call themselves Diaper Gang because they babysit the island’s babies. She’s determined to make money to help get a house for her and Mama, and she’ll try anything - from working on a boat, to searching for buried treasure. Turtle is a relatable character - a fun girl with a sharp wit who can dish it out as good as she gets it. As flippant as her comebacks can be, she has a lot of heart, and loves her mother and pet cat more than anything. The boys she eventually befriends are also extremely believable; they act like frustrating young boys until you get under their tough exterior and find their quirks. The adults all act like real people as well, though they play minor roles - the author lets the kids run the show. This book feels timeless, like it could be set in any era. The town’s slow pace and sense of community come across as typical island lifestyle, but references to the Great Depression, Ernest Hemingway, and the Labor Day Hurricane pinpoint the year as 1935. The shabbiness is contrasted by the vibrant plant life: “Truth is, the place looks like a broken chair that’s been left out in the sun to rot” (13), but it looks like “Mother Nature is trying to pretty up the place” (14). Turtle wants a home she and her mother can call their own. She’ll do whatever she can to help make that happen. This was a common aspiration in the aftermath of the Great Depression, and is still relevant today, as our economy struggles to balance after a crash. Regardless of upbringing, books about childhood are universal, inspiring memories of striving to fit in, long days of play, and the possibility of treasure. The carefree tone of the narration fits perfectly with the island lifestyle. The dialect is integrated smoothly so all ages can follow it without tripping over strange sounds; context clues help define any unknown words, and the custom of giving unique nicknames to everyone helps the reader easily slip into the story. I loved this book; it was easy to read and get sucked in to, and it reminded me of a book I loved as a child: Starring Sally J. Freedman as Herself. It was interesting to read Turtle in Paradise for the first time as an adult because I could relate to all the characters, children and grown-ups, in different ways. It made certain plot points difficult to get caught up in, like hunting for treasure, or stomaching Turtle’s mother’s love life, but did not detract from the story. I would recommend it to children and adults.